Using 140,000 distant quasars, astronomers from the Sloan Digital Sky Survey have made the most precise measurement to date of the expanding Universe. The Baryon Oscillation Spectroscopic Survey (BOSS), the largest component of the third Sloan Digital Sky Survey (SDSS-III), pioneered the use of quasars to map density variations in intergalactic gas at high redshifts, tracing the structure of the young universe. 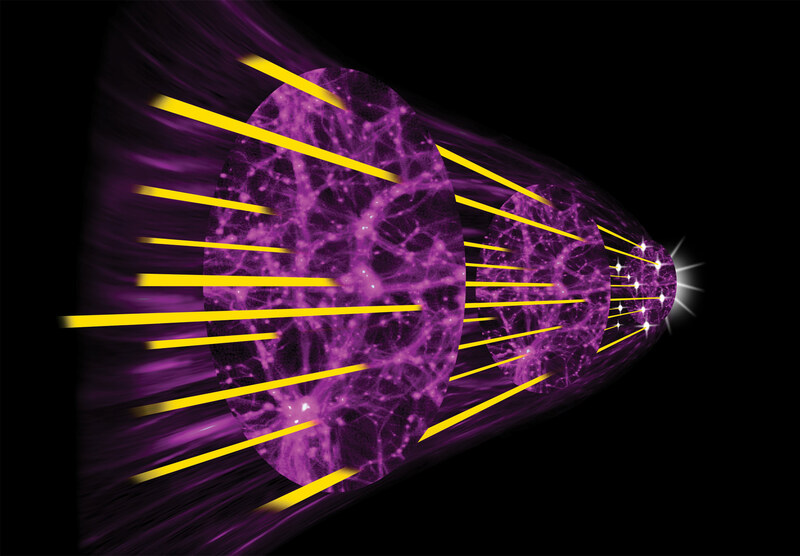 BOSS charts the history of the universe’s expansion in order to illuminate the nature of dark energy, and new measures of large-scale structure have yielded the most precise measurement of expansion since galaxies first formed. The latest quasar results combine two separate analytical techniques. A new kind of analysis, led by physicist Andreu Font-Ribera of the U.S. Department of Energy’s Lawrence Berkeley National Laboratory (Berkeley Lab) and his team, was published late last year. Analysis using a tested approach, but with far more data than before, has just been published by Timothée Delubac, of EPFL Switzerland and France’s Center de Saclay, and his team. The two analyses together establish the expansion rate at 68 kilometers per second per million light years at redshift 2.34, with an unprecedented accuracy of 2.2 percent. “This means if we look back to the universe when it was less than a quarter of its present age, we’d see that a pair of galaxies separated by a million light years would be drifting apart at a velocity of 68 kilometers a second as the universe expands,” says Font-Ribera, a postdoctoral fellow in Berkeley Lab’s Physics Division. “The uncertainty is plus or minus only a kilometer and a half per second.” Font-Ribera presented the findings at the April 2014 meeting of the American Physical Society in Savannah, Georgia. BOSS employs both galaxies and distant quasars to measure baryon acoustic oscillations (BAO), a signature imprint in the way matter is distributed, resulting from conditions in the early universe. While also present in the distribution of invisible dark matter, the imprint is evident in the distribution of ordinary matter, including galaxies, quasars, and intergalactic hydrogen. The BAO imprint corresponds to an excess of about five percent in the clustering of matter at a separation known as the BAO scale. Recent experiments including BOSS and the Planck satellite study of the cosmic microwave background put the BAO scale, as measured in today’s universe, at very close to 450 million light years – a “standard ruler” for measuring expansion. 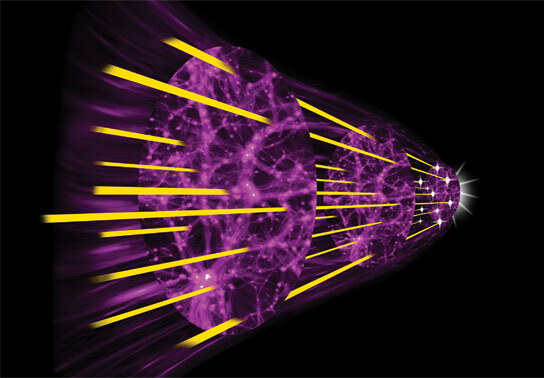 BAO directly descends from pressure waves (sound waves) moving through the early universe, when particles of light and matter were inextricably entangled; 380,000 years after the big bang, the universe had cooled enough for light to go free. The cosmic microwave background radiation preserves a record of the early acoustic density peaks; these were the seeds of the subsequent BAO imprint on the distribution of matter. Previous work from BOSS used the spectra of over a million galaxies to measure the BAO scale with a remarkable one percent accuracy. But beyond redshift 0.7 (roughly six billion light years distant), galaxies become fainter and more difficult to see. For much higher redshifts like those in the present studies, averaging 2.34, BOSS pioneered the “Lyman-alpha forest” method of using spectra from distant quasars to calculate the density of intergalactic hydrogen. As the light from a distant quasar passes through intervening hydrogen gas, patches of greater density absorb more light. The absorption lines of neutral hydrogen in the spectrum (Lyman-alpha lines) pinpoint each dense patch by how much they are redshifted. There are so many lines in such a spectrum, in fact, that it resembles a forest – the Lyman-alpha forest. 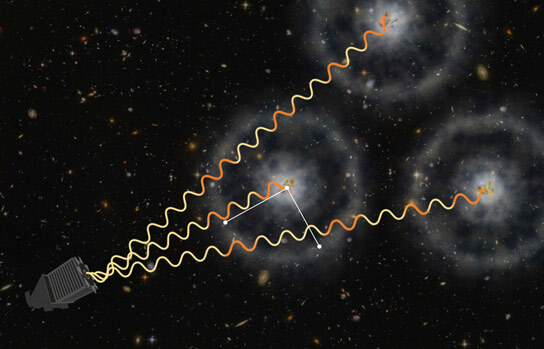 With enough good quasar spectra, close enough together, the position of the gas clouds can be mapped in three dimensions – both along the line of sight for each quasar and transversely among dense patches revealed by other quasar spectra. From these maps the BAO signal is extracted. Although introduced by BOSS only a few years ago, this method of using Lyman-alpha forest data, called autocorrelation, by now seems almost traditional. The just-published autocorrelation results by Delubac and his colleagues employ the spectra of almost 140,000 carefully selected BOSS quasars. Font-Ribera and his colleagues determine BAO using even more BOSS quasars in a different way. Quasars are young galaxies powered by massive black holes, extremely bright, extremely distant, and thus highly redshifted. Instead of comparing spectra to other spectra, Font-Ribera’s team correlated quasars themselves to the spectra of other quasars, a method called cross-correlation. “Quasars are massive galaxies, and we expect them to be in the denser parts of the universe, where the density of the intergalactic gas should also be higher,” says Font-Ribera. “Therefore we expect to find more of the absorbing gas than average when we look near quasars.” The question was whether the correlation would be good enough to see the BAO imprint. Indeed the BAO imprint in cross-correlation was strong. Delubac and his team combined their autocorrelation results with the cross-correlation results of Font-Ribera and his team, and they converged on narrow constraints for the BAO scale. Autocorrelation and cross-correlation also converged in the precision of their measures of the universe’s expansion rate, called the Hubble parameter. At redshift 2.34, the combined measure was equivalent to 68 plus or minus 1.5 kilometers per second per million light years. 1 Comment on "Astronomers Make the Most Precise Measurement Yet of the Expanding Universe"
Could there be some kind of rebound effect from the big bang within the negative energy which would need to be considered in the mathematical measurements relative to inflation and expansion of the universe?